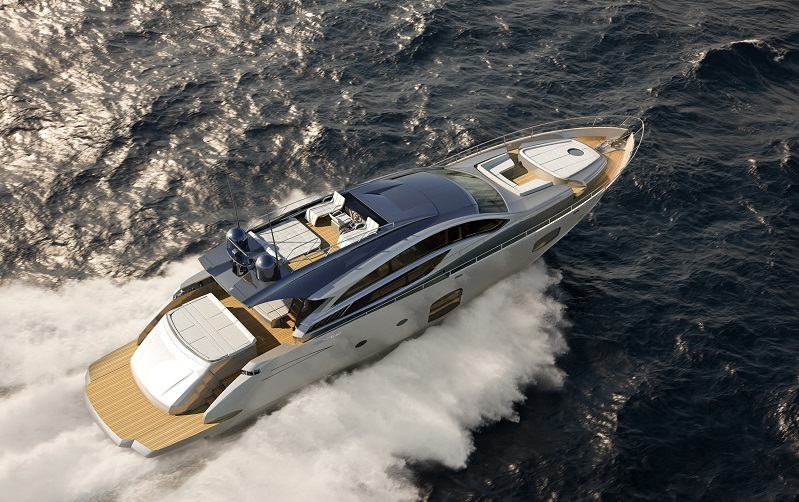 Pershing 82′, penciled by the yacht designer Fulvio De Simoni in close collaboration with AYT (Advanced Yacht Technology – the centre of naval research and design of the Ferretti Group) and the team of architects and designers of Centro Stile Ferrettigroup, features an external profile that is more sleeper and aggressive than that of its predecessor, thanks to the shape of the wider lateral windows which can be opened, providing more interior brightness. The elongated superstructure that enhances the new attractive forms and the introduction of a sun-deck with a retractable platform, which makes the yacht look slender and makes it possible to enjoy unparalleled heights, stand out immediately. 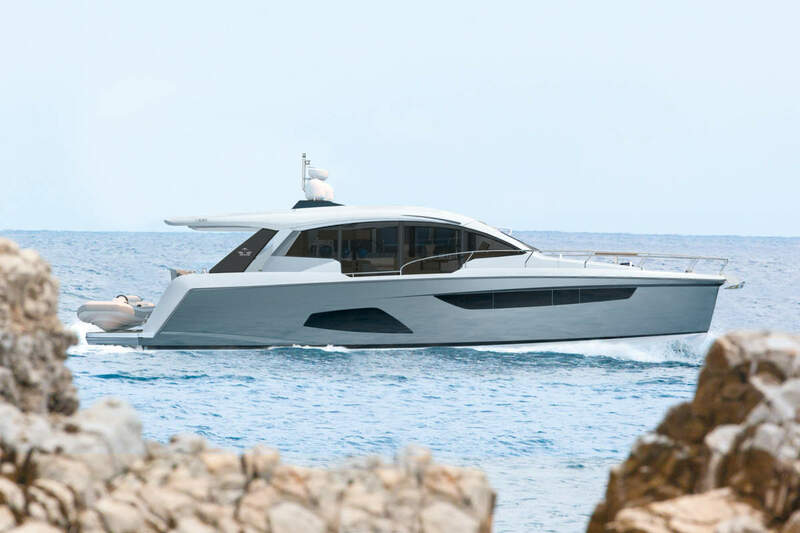 After the success of Pershing 74′, Pershing 82′ returns with a sun-deck, that can be easily accessed from an automated hatch and a carbon steel staircase, a little mechanical masterpiece created by AYT in close collaboration with Besenzoni. The staircase is decentralized and drops automatically into the cockpit by electro-hydraulic control and automatically disappears upwards when closed, freeing the space in the cockpit. The sun-deck is simple and functional: next to the retractable helm, there are two comfortable lateral chaise longue next to the pilot’s seat, in which a practical minibar has been placed. To complete the layout of the sun-deck at the bow, there are sunbeds with separate and folding backrests; for safety purposes on the sun-deck there are two lateral handles and a pulpit which blend in completely with the aesthetics of the superstructure. All the other stylistic features that have distinguished the Pershing models, contributing to its worldwide success, remain the same: the large windows on the walls, the large retractable door that divides the cockpit from the saloon with electro-hydraulic control and the special system of fiberglass vacuum molding. 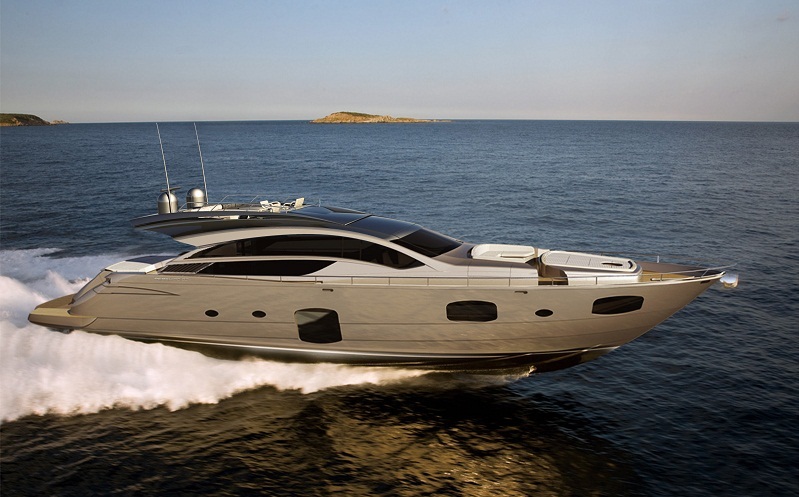 Pershing 82′ is 24.97 metres long and has a maximum width of 5.50m with 4 comfortable guest cabins (the master suite amidships, a VIP cabin forward and two cabins with twin beds at the bow) for the standard layout, or 3 guest cabins for the optional version, with a lounge-cinema room starboard, and two crew cabins with three beds. 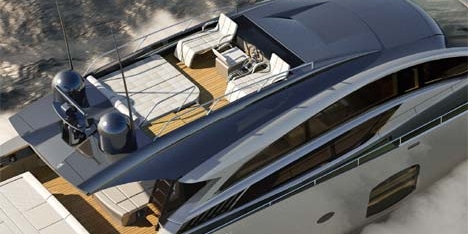 Practicality, combined to design, reigns in the cockpit, where there is a sofa and a seat, which can electrically transform into a comfortable sunbathing area, a mobile bar with BBQ and a fiberglass table, which is the same colour as the hull, providing all that is necessary for social on board living. As in other models of the range, even on Pershing 82′ the sun-deck at the bow is completely independent from the opening of the large garage, which has a folding bottom to facilitate the movement of the jet ski and a tender. This comfort is completed by a retractable catwalk created by Besenzoni. In the wide cockpit one also finds the entrance to the sailors’ area. The main guideline leading the stylistic choices for the large saloon is maximum space flexibility with refined elegance. At the bow, on the right, there is a big L-shaped sofa, while in the middle there is a sofa that can be joined to another one to form a horseshoe. The long-standing and prestigious partnership with Poltrona Frau, that designed the sofas of the saloon, inspired by the model Quadra, has been renewed on Pershing 82′. All the furnishings are made of pore oak while the flooring is made of oak covered in wengè. On the sun-deck there is also a comfortable sunbathing area at the bow, with dinette and a table, providing complete privacy in an area that is entirely dedicated to relaxation. 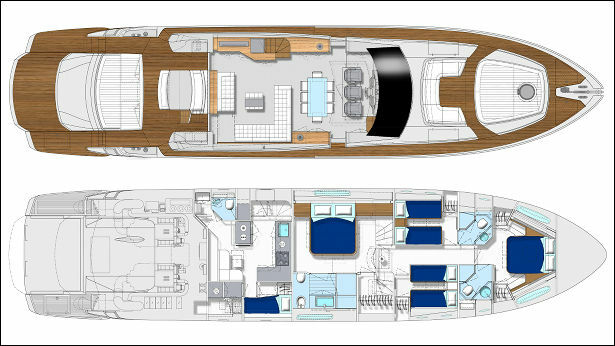 Below deck, space is typical divided for a mega yacht, for example the galley is separate from the saloon and it combines with the crew area to allow greater privacy for the guests and the ship owner. The galley, which is L-shaped and is completely separate from the sleeping area, has a dinette and a folding table, ensuring comfort and a decent life on board. The crew area, which is made of two cabins (one for the captain and one for a sailor) as well as a laundry and a bathroom, can also be accessed from the kitchen. The standard sleeping area, made of 4 cabins, is a model of comfort and design. In the master suite, amidships, we find the appreciated wide open-view windows, which marked the aesthetic course of the new Pershing range. The sinuous shape of the window draws in a generous passage of light that throws a pleasant play of lights onto the Poltrona Frau leather furnishings. The VIP cabin, at the bow, with an en-suite, features an elegant central bed and two big lateral wardrobes, while the two guest cabins have a more traditional setting with two twin beds. All the guest cabins have a carpet. The wrap-round light system, which was already used on Pershing 74′, provide indirect lighting with the embedded LED lights, distributed along the ducts on the concealed molding emphasizing the homogeneously diffused lights giving a modern style to the environment. Moreover, all the internal steps have a LED step signal. Besides the innovative solutions designed for the external structure and for the design below deck, the new Pershing 82′ was developed to ensure maximum performance at sea: two powerful coupled MTU 16 V M93 of 2435 mhp (1792 kW) with Searex SR140S surface propellers of ZF that guarantee a maximum speed of 45 knots and a cruising speed of 40 knots and high levels of comfort, besides the autonomy of more than 300 nautical miles. The Autotrim of ZF contributes to the high technological level of this vessel. It is a system that is capable of optimizing performance at any speed automatically.